Last week, Tesla unveiled a new sports car that, according to the automaker, can go from zero to 60 miles an hour in 1.9 seconds, making it the quickest accelerating production car ever made. Beyond that, it has a top speed near the all-out fastest road cars in the world. Oh, and it also might fly. 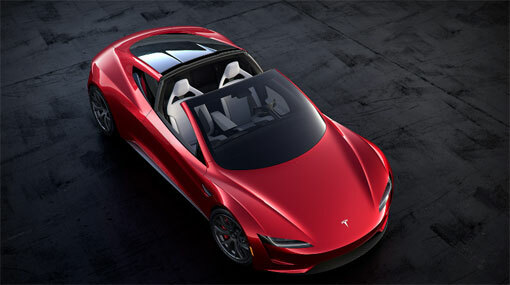 “Not saying the next gen Roadster special upgrade package *will* definitely enable it to fly short hops, but maybe...” Tesla CEO Elon Musk Tweeted Sunday. Musk had been Tweeting about a “special option package” for the Tesla Roadster that “takes it to the next level.” He implied that the 1.9-second zero-to-60 times, which already beats the quickest cars now available by nearly half a second, could be improved upon with a future upgrade. “Just a question of safety,” Musk said of the possible flight option. Musk is also CEO of the rocket company SpaceX, although the enormous rockets SpaceX makes would obviously be very different from ones that would launch a car off the pavement. A number of companies are working on ”flying cars” which, for the most part, amount to road-worthy airplanes that could legally be driven on streets. Musk seems to be talking about something different, a sports car that could “hop” over obstacles. The emphasis would, presumably, still be on performance and practicality with four wheels on the ground. The Roadster was revealed as a surprise addition during the same Thursday night event at which Tesla unveiled its electric semi-truck.